Parents’ first priority is protecting the well-being of their children. Keeping them out of harm’s way is no small feat, between potential slips, falls, and other accidents. But what about the dangers you can’t see coming? An important one to know about as summer approaches is Electric Shock Drowning (ESD). Unfortunately, it’s more common than you might think in coastal areas like Aquidneck Island. Boats, energized docks and marinas rely on high-voltage power sources. When wiring becomes faulty or frayed, electricity is inadvertently leaked into surrounding water. It can happen with out warning, and can’t easily be detected. AC current flow of around 100 milliamps of AC current is considered lethal. But lesser amounts, even 15 milliamps can create muscle paralysis and risk of drowning. Newer boats tend to be safer. The American Boat and Yacht Council (ABYC) created standards in 2010 to require an Equipment Leakage Circuit Interrupter (ELCI) on all new boats. These interrupt the circuit to prevent electricity from circulating in water. Fresh water presents more of a risk than salt water, as salt water is a better conductor of electricity than the human body. Still, proper precautions should still be taken in salt water. 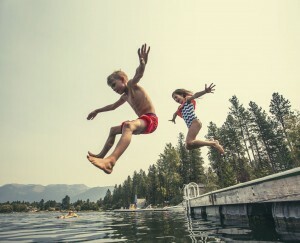 Avoid swimming near docks with energized 120-volt AC power altogether. Avoid swimming where a boat is plugged into a dock’s electrical outlet. Ensure boat marinas and private docks have Ground Fault Circuit Interrupters (GFCIs) at all electrical hookups. Test to see if a boat is leaking electrical current with an AC clamp meter. This measures electricity feeding into the boat’s system and back. If the two numbers aren’t exactly the same, electricity is being leaked into the water. Work with a certified marine electrician to safeguard your dock, marina, or boat’s electrical system. Share what you have learned about ESD and how to prevent it. You can read more about this important issue in this article published by Boat U.S. Be safe out there this summer, and remember to work with your licensed electrician to safeguard your summer fun.